Apart from being an overall amazing country, America brings a number of unexpected – and not always very welcomed – guests to the table. 12 newly added pounds around your waistbands stand for a few of them. A diet depending on pizza, pasta, French fries, milkshakes, peanut butter cups, cheese steaks and unhealthy amounts of root beer apparently leaves its traces. No doubt about that. But, what is even more surprising than the additional body volume a person can gain in less than two weeks is the never-ending supply of suspicious food combinations that the States has to offer. And yes, Sundae is an ice cream. 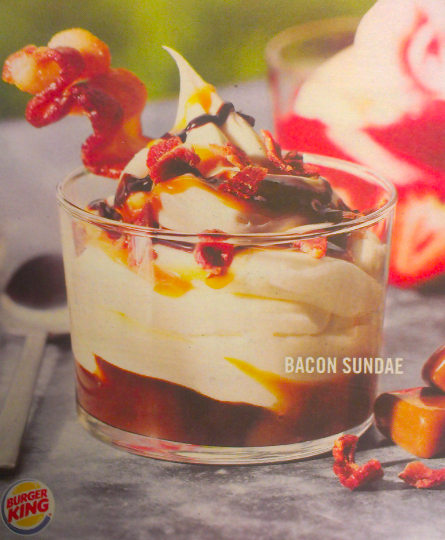 And yes, it comes with bacon topping. I am sorry, but I have a really hard time believing that this gastronomic merger is what we, in everyday speech, would call “a party in your mouth”. Seen on your way from New Paltz to Atlantic City. Yummy. That is just too much, yrk!